On Sunday 25th August, 1782, in Kingsclere church, after evening prayer, a vestry meeting was held to "to consult on the utility of a workhouse being made in the same parish." For 11 voices, against 4 voices. (Hampshire Record Office, HRO 90M72/PO2). There is no further information, although a minute of 16 March 1783 notes that "It was agreed that the bill respecting the house at Fair Oak should be paid by the overseers of this parish." A later item (HRO 19M76/PO9) records the issuing of Workhouse Bonds for the erection of a workhouse not to exceed £300 in total, repayable after 7 years, interest 5%. Four bonds each for £50 were issued in May 1798. Hampshire: Ashmansworth, Baughurst, Burghclere, Crux Easton, Ewhurst, Hannington, Highclere, Itchingswell [Ecchinswell], Kingsclere (3), Litchfield, Sydmonton, Tadley, Woodcott, East Woodhay (2), Woolverton [Wolverton]. The population falling within the Union at the 1831 census had been 7,885 — ranging from Ewhurst (population 38) to Kingsclere itself (2,532). The average annual poor-rate expenditure for the period 1832-35 had been £6,500 or 16s.8d. per head of the population. 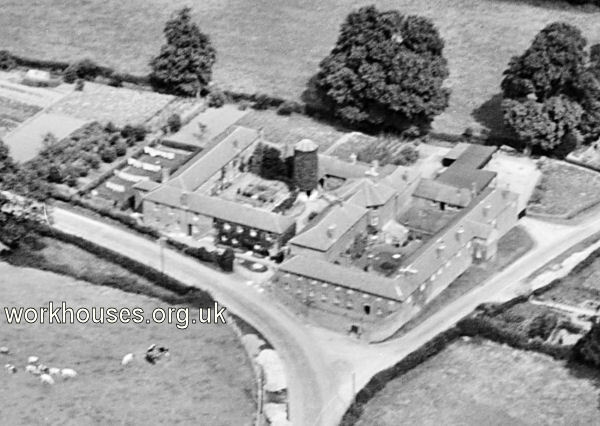 The Kingsclere Union workhouse appears to have been the result of a substantial enlargement of the existing parish workhouse at a site on the Newbury Road to the north of Kingsclere. In 1836, the Poor Law Commissioners had authorized the sum of £4,225 for the construction work for which the architect was George Adey. The resulting layout produced two courtyards with a supervisory hub at the centre. The workhouse location and layout are shown on the 1911 OS map below. THE UNION WORKHOUSE is at Kingsclere, and was built in 1835-6, at a cost of about £3500, and enlarged about 1850, at the cost of £1100. It has room for 300 inmates. but only had 143 in 1851, when the census was taken. The Board of Guardians meet every Tuesday, alternately at the Workhouse, and at the Carnarvon Inn, at Whitway, in Burghclere parish. The expenditure of the Union, in 1858, was about £5900. Frederick Valpy Graham, Esq., is the Union Clerk and Superintendent Registrar, and the Rev. Lewis Rugg, chaplain; Mr. and Mrs. Gethin, are master and matron of the Workhouse; Richard Selley, porter, and Jane Lush, schoolmistress. The Relieving Officers are Charles Triggs, for Kingsclere District ; and Charles Ralph Hall for Highclere District. The latter is also registrar of Births and Deaths for Highclere District; and Mr. Henry Dale, is registrar for Kingsclere District. Mr. Dale is registrar for marriages for the whole union. The Union Surgeons are Messrs. Oliver Fowler, George Lawson Thomas, and George Fort Fox. The buildings have now been completely demolished. After a period of use as a coal-yard, the site is being redeveloped. Hampshire Record Office, Sussex Street, Winchester SO23 8TH. Holdings include Guardians' minute books (1835-1930); Admissions and discharges (1874-79, 1907-50); Births (1866-1930); Deaths (1866-1956); Creed register (1902-14); Punishment books (1871-1936); Inmates property register (1914-49); etc.